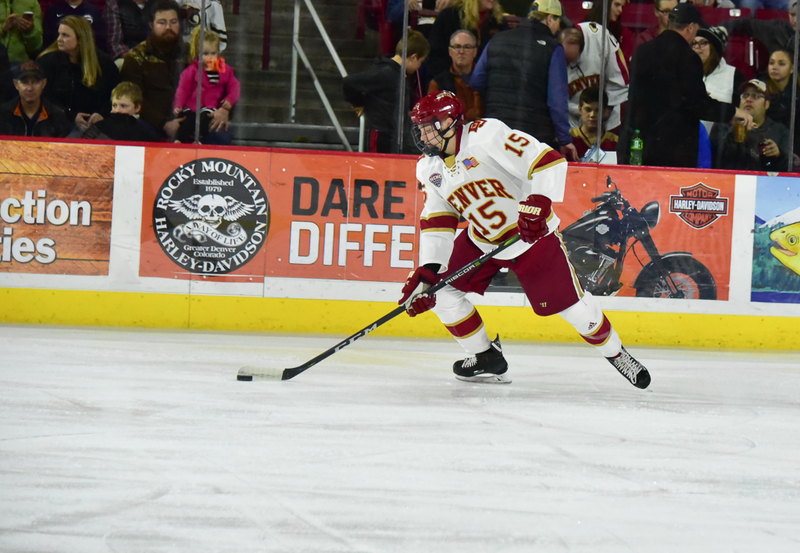 For Denver, defenseman Ian Mitchell had three assists and was plus-two and Blake Hillman put two shots on net. Penn State forward Evan Barratt was minus-two with three shots on net. Notre Dame advanced to the Frozen Four again, eliminating Providence on Saturday. Defenseman Dennis Gilbert put two shots on net and was plus-one. Defenseman Chad Krys was plus-one in the upset. Forward Beau Starrett put two shots on net in the loss. Michigan ended Northeastern’s season on Saturday. Forward Dylan Sikura’s college career ended with one goal and a minus-three rating; he put four shots on net. Defenseman Ryan Shea was minus-one with two shots for Northeastern as well. Krys and Boston University will play Michigan on Sunday. Mitchell, Hillman and Denver will play Ohio State on Sunday. How quickly will we see Sikura? As fast as his -3 tonight against Michigan! Again, this is the Stan Bowman special! Creating the NCAA college hype like he did with Tyler Motte’s last college season! Remember Motte’s stats? Same as SIKURA, who weighs 165 as a 22 year old??? Now, where is Graham Knott? A higher draft pick than SIKURA. I wish Sikura lots of success, but his is not a top 6 forward, more of a bottom 6 thatb we do not need. But he will play some games at the end of this season with the HAWKS. And then, we will hear about his father loving the HAWKS followed by Sikura parading at the Convention in JULY like Baun from Cornell did a few years ago, remember him? At this point it’s just speculation whether (1) Sikura signs with the Hawks and (2) what kind of success or lack of success he will have in the NHL. We do have some information on which to base the speculation though and (1) Bob McKenzie tweeted that he thought Sikura would sign with the Hawks and (2) he is a better college player than either Motte or Baum mainly because he skates much better then Motte and Baum. My opinion, based on limited viewing, is that he will be a solid top-6 player, if not immediately, then within a year or so. His offensive instincts and skills are very good. His challenge will be handling the size and physicality of the NHL – who knows if he will be a star or shrinking violet until he has the chance to show us. If he doesn’t make it – who cares, he’s a 6th round draft pick. If he does make it, it’s like hitting a homer. Sikura can be available as early as Thursday. The deal is all but finished at this stage. When Sikura signs as it seems likely he will now and possibly be in lineup Thursday night. He has alot of skill and speed who could become a top 6 forward but time will tell. He may get the same treatment as deBrincat and allowed to build confidence on 3rd line as he works his way there. Signing now and burning a year likely means in lieu of any big bonuses but will also mean he will need protected in next expansion draft if held in 2020 as expected. Anyone who starts 1st pro contract next year will be exempt. Getting him signed is the main thing though. Of all the Blackhawks NCAA prospects playing this weekend who are rumored to possibly sign elc’s which doesn’t include Mitchell. Sikura was the only one who looked like he could be ready for NHL to start next season. But a very small sample but also on a big stage too. You’re wrong on Sikura. He’s a solid top 6 potential. He’s not like the other college signings in the past. The Edje- imo- best forward on ice for Hogs. Nearly walked around a few guys in 1st… but they either got a small piece of his shot (officially only 1 shot… but several partial blocks and couple missed net…. I thought his skating was good for tall guy. But than again- I can see Kane or Schmaltz or D-Cat/Sikura ALL making the Edje look way better too!!! I see this kid as an easy/Cheaper “replacement for AA” (if Bowman has right deal this summer)… Edje- easily puts up 20-30 g’s in full season with Kane and ??? That’s my Opinion. I need to tap the brakes a little on my earlier post. 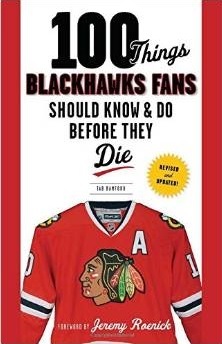 Bob McKenzie didn’t confirm that Sikura is going to sign with the Hawks – he merely re-tweeted Hawks beat writer Mark Lazerus quoting a “league source” that Sikura could be in the Hawks lineup as early as Thursday. In other words – nothing has been confirmed. I had envisioned that when Sikura signed he would join 88/19/20/12/8 in some configuration, but now that Toews is out of the lineup the line blender can, and probably will be out of control. I picture the top of the blender not being in place and stuff flying out in every direction, with mad scientist Q heard laughing maniacally in the background. I hope Sikura does well, but its really hard to know. Motte racked up solid numbers in college but he was always more of a grinder type although I thought he would be better than he has shown. I like Caggiula and had hoped we signed him, but he hasn’t exactly lit it up. Then there is Leblanc who won Hobey despite the fact (that everyone seemed to miss) that he couldn’t skate. There is the odd stud, Boeser is this year’s, but not many. Hopefully Sikura suits up for us, but it would be a win for us if he even makes the team next year and is an upgrade over that junk we have on wing right now. The Hawks just “recalled” Edjsell on what is called an emergency basis. He will wear #14. So we’ll get a look at the lanky Swede soon. I caught about 10 minutes of the Icehogs game on TV a yesterday and the couple times I saw Edjsell on the ice he looked … well, I wouldn’t go far as to say “lumbering”, but let’s just say his skating may be an issue. Again, a very short sample size so hopefully I got the wrong impression. Scott Powers just tweeted Sikura signed … details coming soon. I watched a ton of College Hockey in the last two days. Chad Krys. Excellent game against Cornell. Made really good first passes out of the zone, his coverage was very very good, and his puck retrieval with a forward bearing down on his was terrific. Analyst Billy Jaffa remarked on his solid play a couple of times. Dennis Gilbert- he was Dominant in the first two periods against Michigan Tech. He laid some beautiful checks. He also showed a nastiness around his own goal, crosschecking and throwing guys out of the crease area. Unfortunately, the smaller Michigan Tech team, figured it out and twice in the third period Gilbert was beaten wide, by speed. That will need to get cleaned up at Rockford or guys like Arvidsson of Nashville and Schwartz of St. Louis will just blow by him. Ryan Shea – Really good player for Northeastern. He’s tall, skates really well, covers a lot of ground in the defensive zone. Wins board battles. He’s a real sleeper when it comes to the Hawks defensive prospects. One negative, his man beat him to the net for Michigan on the winning goal. The player drove the net with Shea covering him. Shea tried to tie up his stick, but the guy took the pass and was able to bury it. Decent coverage just not hard enough. I wasn’t too disappointed because that play pretty much ended Sikura’s college career and led to his signing. Fortuitous. Beau Starrett, Cornell. Big body who is not afraid to get his nose dirty. But he did not seem like a threat to score. He got bumped up to the top line against BU and was willing to lay the body on people. But to my eye, that all he is is a banger. Cornell did not have him out there for the final 3 minutes when they were trying to tie the game. He might one day play in the AHL but the ECHL is filled with College players like him. Craig – I was impressed with Shea, decent size and very good skater and puck handler. I was a bit underwhelmed with Gilbert’s skating – he was playing a lot of minutes so possibly fatigue played a part. He plays the body very well but NHL speed would cause major problems. Didn’t see the Denver game but Mitchell looks to be the real deal. People say were small need size, then you have guys like Gilbert and people say blow by him. How do you do. I like this Mitchell fellow for awhile now.